Over the course of over 30 years, the Sundance Film Festival has either epitomized the progress of American independent film or its clichés, depending on your point of view — but nobody can deny that the Park City gathering has provided the chief platform for many of the most significant North American features released since its inception. As America’s festival of record, Sundance has never lost its capacity to push emerging filmmaking visions toward greater exposure; in fact, as the marketplace for new movies made outside the studio system grows increasingly dense, the importance that Sundance derives from being the first major festival of the year has arguably expanded along with it. While nowhere near the colossal scale of the Toronto International Film Festival, Sundance’s January program is still daunting and few people have the capacity to take it all in. While the movies with the most obvious commercial appeal and star power tend to hog the spotlight, the festival gems often hide elsewhere, most significantly in recent years due to a promising new sidebar called “NEXT <==>,” which the festival launched four years ago in order to accommodate lower budget, scrappier alternatives to the rest of the festival. Though it took some time for NEXT <==> to find its groove (and for journalists to get used to the unorthodox spelling of the section’s name), by this past year, its collection of unique, frequently off-kilter visions ended up defining the festival spirit better than any other aspect of the program. Movies such as Andrew Bujalski’s eccentric period comedy “Computer Chess” and the phantasmagorical shot-in-Disneyland guerrilla exercise “Escape From Tomorrow” stood out because of their peculiar styles and original storytelling, which helped resurrect a kind of spirit that the market-driven of the forces at the festival had long held back. So it’s no surprise that it continues to capitalize on the section’s appeal: Today, Sundance begins the first edition of Next Weekend. The four-day showcase in Los Angeles features 10 features and 10 shorts, including a handful of highlights from January’s NEXT <==> lineup along with two world premieres and selections that played at other festivals. While not every selection challenges audiences, much of the program shows a commitment to shaking up filmic conventions. 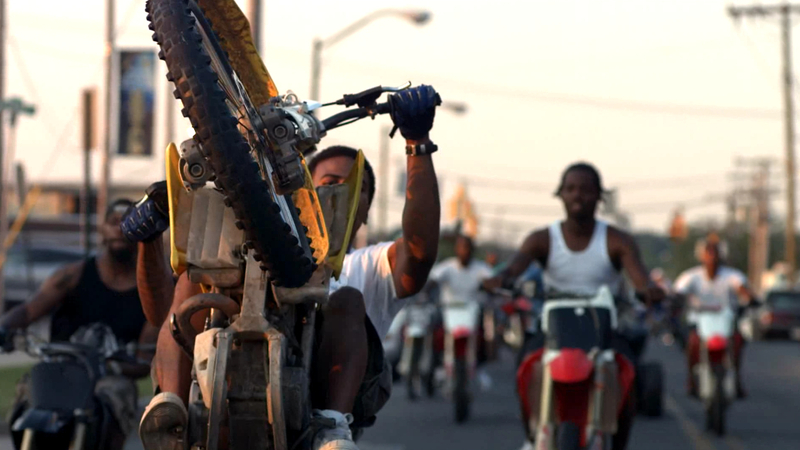 The urban biking documentary “12 O’Clock Boys,” which premiered at the SXSW Film Festival in March, conveys an expressionistic ode to the daring antics of lower class Baltimore teens through a succession of images and small moments rather than a slew of talking heads. The unnerving “It Felt Like Love” turns the tropes of a coming-of-age drama into a horrific sexual thriller, not unlike “A Teacher,” a tale of forbidden love between a teen student and his instructor. “Newlyweeds” funnels the ingredients of a stoner comedy into a subdued, relatively straight-faced character study about arrested development. Cooper said that this willingness to toy with existing expectations has always been the focus of NEXT <==>, citing examples from the past three years. “When you look at some of the films we’ve showcased — ‘Compliance,’ ‘Bellflower,’ ‘Sleepwalk With Me’ and ‘sound of my voice’ — you can really see a common spirit,” he said. Indeed, that quartet are among the most notable to have screened in the section, partly because of the hype they generated at the festival because they seemed to come out of nowhere and seize control of seize the buzz from higher profile films. Meanwhile, some of the other Next Weekend selections have less hype associated with their appeal but certainly benefit from being pulled out of the crowd. The two world premieres, Chadd Harbold’s irreverent comedy “How to be a Man” and Madelein Olnek’s lesbian buddy comedy “The Foxy Merkins,” both promise to upend genre conventions with a playful spirit. “This Is Martin Bonner” is a quiet, unassuming story of a man who helps newly released prisoners reenter society, but derives much of its appeal from the nuanced performance of middle aged leading man Paul Eeenhoorn, whose small gestures convey more about his troubled past than the plot. And the naturalistic “Stand Clear of the Closing Doors,” about an autistic child who gets lost in New York City, derives its chief emotional intensity from scenes shot in the aftermath of Hurricane Sandy.